Billy Pilgrim came for Thanksgiving then swiftly became unstuck in time. He travelled onward… or back. 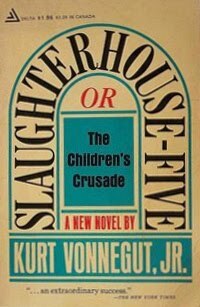 Those of you who remember Kurt Vonnegut’s Slaughterhouse-Five know that when time came unstuck for Billy, he could spring forward to a happier place or he could fall back to appalling happenstance, like the bombing of Dresden during World War II. Billy had no say when it came to the matter of time. We, however, have a modicum of control over ours. We even time travel- to an extent, not physically like Billy, but we can remember… relive what that shiny red bike looked like on that best Christmas ever, recall what it felt like to hold a newborn. We think ahead, hope for better, and manifest our dreams. The Pilgrim within gets to choose where we travel. We don’t have to visit any of the ugly stuff, past present or future if we don’t want to. In one of my favorite parts of Slaughterhouse-Five, Billy’s fiancé flashed her diamond ring at Mr. Rosewater, “Billy got it in the war,” she beamed. Did she know that the gem came from rubble which once was Dresden; the rock was a spoil of war? To her it was a symbol of love, her dream of upcoming happiness, her time travel forward. Mr. Rosewater’s reply could not have been challenged, “That’s the wonderful thing about war. Everybody gets something.” I get it, Mr. Rosewater. Some people get diamonds and others get dead. Without understating the sufferings of war by comparing them to holidays, I have to admit that similarities do exist… especially this particular Holiday Season. And as I travel back to our family holidays, they were like a series of tiny Napoleonic battles. We shouted, pounded on tables, about politics, social issues… religion, we dug up past resentments… said hurtful words. There is no doubt that we loved each other, we loved each other like mad, but with the collective holiday anger of my crazy family? Unite us, add one case of brandy, a few bottles of Ouzo and we could have invaded Canada. That’s the thing about holidays, everybody gets something. Some get arguments and some get loved, some get the Lexus and some stand in line for a meal. Some children get a bike and others get shot. So as the month of gratitude gives way to peppermint truffles and decadence I will live my moments more deliberately, select my thoughts carefully, choose the kindest words possible when speaking about our world as it is. And with my memories, I guess, I’ll be selective. After all, those impetuous relatives are sorely missed now. So it goes. I look forward with hopefulness, to a time when peace on planet earth is achievable. I’ll dream that everyone everywhere has food, clothing and shelter. I’ll imagine that it’s so. And I will accept what I get this year (thank you very much for the lovely brown socks) with grace. I hope for patience and tolerance from all of the people I love. No gifts for me this year, there’s nothing I need, except one favor from all. I need an advance on forgiveness, like a caveat, a hall pass or a ‘get out of jail free’ card. Those will do very well for me, please. Because I, like Billy Pilgrim, have a history… and probably even a genetic pre-disposition to becoming unstuck… just a little. A while back, I wrote a blog entitled, The Hurrier I Go, the Behinder I Get. Does that sound like you? Especially during this holiday season? There are so many things that must be done in such a short amount of time. Cleaning and decorating alone, can be very time consuming. Writing and sending cards, planning parties, meals, preparing for visitors, gift buying/making, wrapping, sending/giving, the list goes on. And it seems there is always something that will put us behind schedule, an illness or accident, for instance. Unexpected “somethings” abound. Eeeeeeek! I’m going to play “mommy” for a minute and remind you of something you already know. Obstacles are going to bar your way. It’s how you handle them that helps you keep your sanity. That’s a short sentence, but it’s packed with importance. And worrying does not take away tomorrow’s troubles; it takes away today’s peace. Here are a few pointers I’d like to share that just might ease your emotional load. First of all, this is a season that reminds us to be peaceful and to love others and enjoy this time. With that in mind, I find it helpful to have holiday music playing while I attempt some of the chores ahead. Making a short list of three or four items and checking them off as I progress, and then making another short list on another piece of paper underneath the first one keeps me from being overwhelmed and checking off items makes me feel like I’m getting somewhere. It helps being determined not to let frustrations enter my mind by making an adventure out of some tasks that would ordinarily be mundane or even aggravating. Treating myself to a cup of hot chocolate, apple cider or special tea, boosts my spirit and reminds me why I am toiling away, to make this holiday special for someone else, and has the benefit of making the holiday special for me, as well. If you are still having anxiety, put everything in perspective. In your mind ask these questions. A year from now, will I, or anyone else, remember how stressed out I was during this season? Is that a good thing? In five years, will I, or anyone else remember how stressed out I was during this season? In ten years, will I, or anyone else remember? In thirty years, will I even be here? Will anyone even remember ME? If so, how will they remember me? If you are a young person, you can extend this perspective example. If all else fails and everything threatens to be too much, simplify. Take a deep breath. Try to relax. Remember the reason for the season, and with love in your heart, have a Merry Christmas and a very happy and prosperous New Year!